I absolutely love concord grapes. 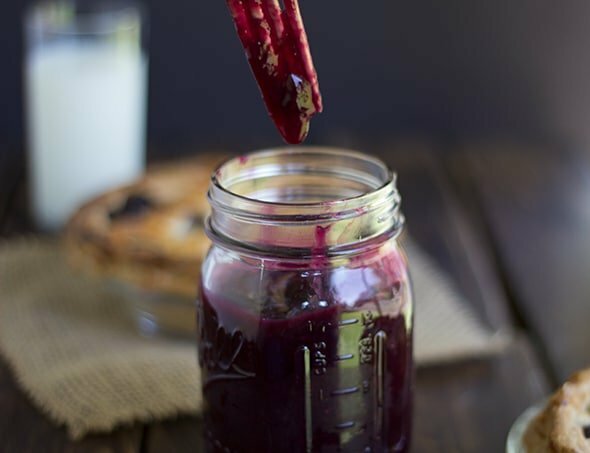 To can/preserve anything that has to do with concord grapes is truly a labor of love. It can be such a pain, but well worth it. Trust me. Want to know a secret? I hate the seeds that concord grapes have. I can tolerate popping 5-6 grapes in my mouth, but then I get discouraged by the seeds. 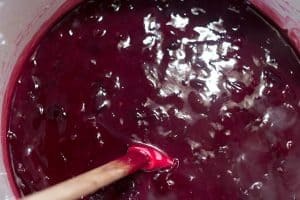 The concord grape pie filling is a beautiful purple color and thick! If your love for concord grapes gets out of hand, you can just eat the pie filling by the spoon full. You have the OK from me! 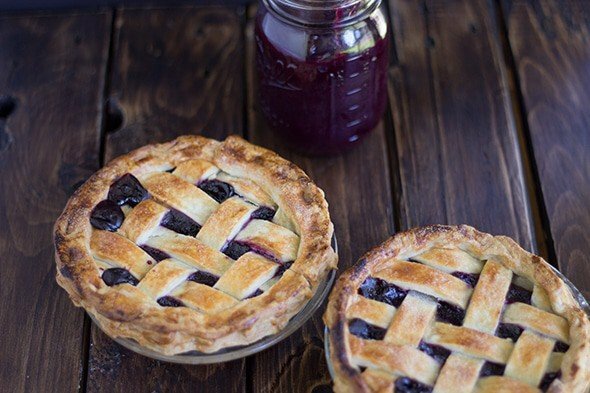 The grape pie filling becomes bubbly and firm when it’s baked into a pie. It won’t be runny when you cut a slice of pie. 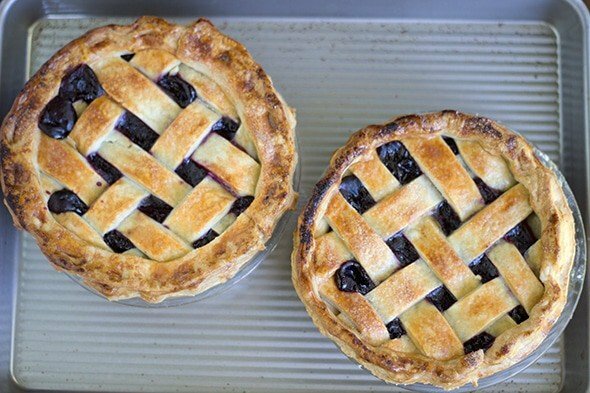 I love the looks for the filling that has bubbled out of the top of a lattice pie shell. If you’re wondering what a grape pie tastes like, it’s like a great big heavenly jam sammich. In the case of these mini pies, a baby heavenly jam sammich. Want to hear a secret? I watched as a fight almost went down over these two baby pies. I had taken them down to my parents to share. I knew if I had them hanging around here, I would eat them both. 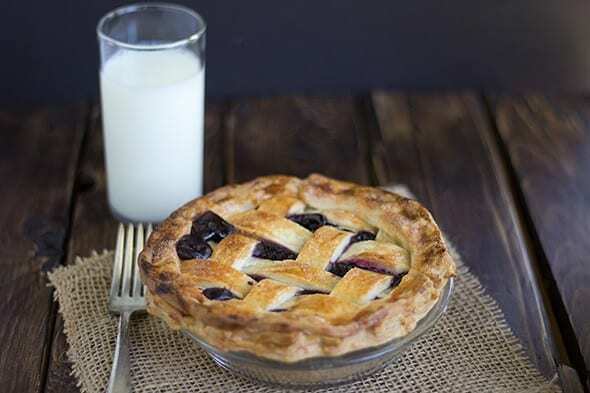 It would be grape pie for dinner and dessert kind of deal. Using two large saucepans, separate the skins into the (larger) pan and the pulp into the other pan. Once you have all the grapes separated by the skins and pulp, set the skins aside. Heat the grape pulp over medium heat. Stir the pulp and let it boil for about 15 minutes. Remove from the heat. Place a strainer on the saucepan with the skins in. Push the pulp through to catch all the seeds. Discard the seeds. In a separate bowl whisk together the sugar and clear jel. Add 2 cups of the grape skins/pulp into the sugar and clear jel and continue whisking. This will help to avoid lumps into the mixture. Place your hot water canner onto the heat now. Pour the sugar mixture into the pot with the rest of the grape pie filling. Place over medium heat and give it a stir to incorporated the sugar mixture.Let the filling come up to a boil and stir occasionally. As the mixture thickens, it will change from a green, to pink, to light purple, and when it's ready it will be a deep purple. 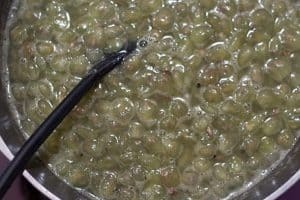 Boil for about 45 minutes until very thick and bubbly. 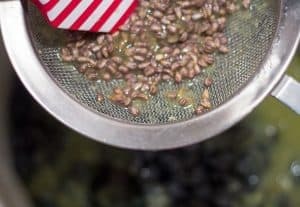 Place your clean jars and lids into the canner to sterilize them. Place the hot pie filling into hot sterilized jars. Wipe the rim with a damp towel. Place a hot lid on and ring. Tighten the ring down. Place into the hot water canner and make sure the water covers the lids. Once the water comes up to a boil, boil for 30 minutes. Remove from water and place under a warm towel. Let it sit overnight. Lightly flour a clean counter top. Roll out into a circle. You'll want it to be about 10 inches. You can eyeball your 8 inch pie plate and the circle to see if you're close. That's what I do. Once your circle is right, fold the dough in half and pick it up and place onto the pie plate. Unfold the dough and push the dough onto the bottom and sides. Go ahead and put the quart of pie filling into the bottom of the crust. To make the lattice crust, roll the dough out like we did with the bottom crust. Once roll out to about 10 inches in diameter, use a pizza cutter or pastry cutter and cut inch strips. Place the strips over and under each other kind of like a basket weave. Crack the egg in a small bowl. Using a pastry brush, brush the egg wash on the top of the pie. When my husband gets home from work and sees me repeatedly spooning pie filling into my mouth I’ll just tell him it’s okay, Miranda said I could do it LOL!!! That’s right! He won’t have a problem once he hears that I say it’s okay! haha! Oh my! A crumb topping would taste insanely delicious on this! 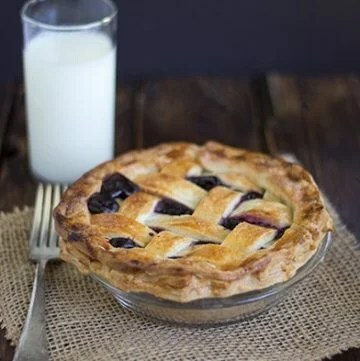 PIE!!! Just gotta love pie. I’ve never had grape pie though – I bet goes down well at Christmas dinner! lol it goes down well at any time! Especially if you can it and are able to make it whenever! Thank you! 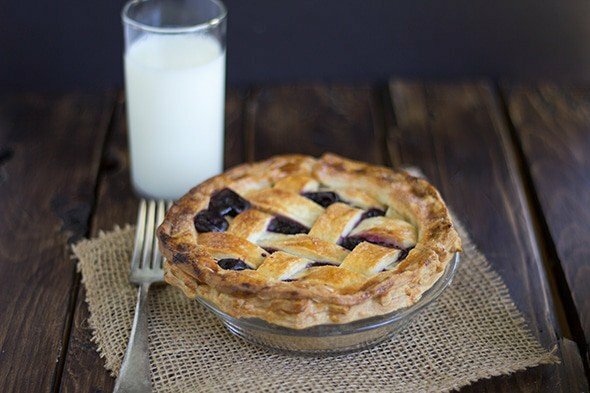 Homemade pie is so much better than a store bought! It was my pleasure! Can you use instant tapioca instead of clear gel? If so how much? I haven’t tried it, Tonya but I’m sure it will work. I’m just not sure of the measurements for it. Hi Tom. After they’re stripped from the bunches. 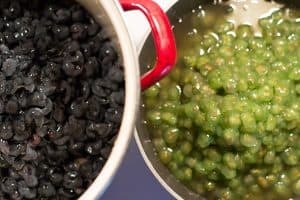 Yummy pie filling! I got 4 qt jars from this batch. I just made little tarts in a muffin tin with a crumble topping. So yummy! I think I might need to go pick more grapes! 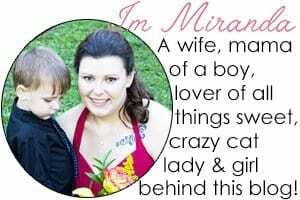 I live in the Finger lakes region in upstate NY where there is a grape festival every year. Grape u-pick patches are everywhere for .40/lb! I’ll be making more of this real soon! Thank you!